A clichéd piece of advice is to ignore your competitors. It’s universally agreed on, yet ask any founder how their competitors are doing and you’ll see it’s almost universally ignored. They’ll fly through a list of players providing commentary quicker than a sports announcer. The cost of any success is that people copy you. If your “mix some photos with a song” app takes off, rest assured there’ll be twenty of them in the weeks to come, each with similar features, logos, names, and users. If you are the first in a market it means you must bear all the costs of creating that market. You incur all the pain of convincing the world your offering is valid, and then when proved right, all the fast followers show up. Fast followers benefit from all your spend, they copy the parts of your product that work well, dodge the pieces that you fumbled through, and can use your product as a frame of reference to explain themselves. They have many advantages, their model is simple: watch, learn, and copy. They don’t make your mistakes, and they can often find cheaper, quicker ways to get to your potential customers. First mover advantage is frequently misunderstood and almost always overrated. Their weakness is that they don’t actually know what they’re doing. They have no strong vision, they can copy the “what”, but never the “why”. Their best outcome is a bad copy of your hurried execution. This is one of the reasons speed is important in early stage technology companies; if you are moving fast enough then you’ll limit your followers to shipping yesterday’s ideas tomorrow. Some products adopt the features of every product they stumble upon. If they see you with even a drop of traction, they’ll copy it, regardless of whether your success is in any way relevant to their product. They might start out as a project management app, before quickly concluding that issue tracking is also a must-have, followed by a help desk, then time tracking, then file management. It can sometimes feel like their product strategy comes from refreshing Product Hunt all day and adding the top three apps. My suspicion is more that the product owner struggles to draw the line anywhere. It’s true that there’s a lot of bad software out there, but it doesn’t mean your product can single-handedly replace all of it. Their one-size-fits-none approach usually sows the seeds of their own destruction. The final product is a disconnected suite of tangentially related products with nothing in common other than a navigation bar. They can’t describe themselves, so their marketing is a mess. Their word of mouth suffers from the product version of the “Blind Men and the Elephant” parable. All their customers are effectively using very different products, and hence speak about it in very different ways. Aside from the noise they create, these products rarely pose a threat and usually take care of themselves. Napoleon’s advice rings true: never interrupt an opponent if they’re making a mistake. It’s almost always a mistake for a would-be founder to look at an existing product and conclude, a priori, that they can deliver the same service cheaper. Usually they’ll run the numbers, calculate for the umpteenth time that 2,000 customers paying $50 a month, will make them a millionaire. They promise big and usually paint themselves into a corner with their talk. What they’ll never realise is that to acquire 2,000 customers, to keep the product reliable and fast, to support them, to deal with their feature requests, to expand on the feature set as needs be would mean adopting the cost base of the product they’re copying. 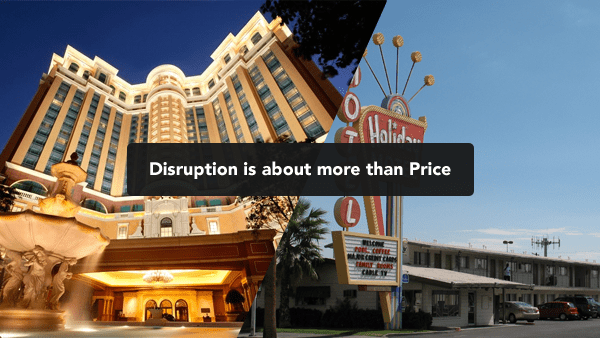 They think they’re disruptive, but low price alone is not disruptive, it’s just cheap. Much like a roadside motel doesn’t disrupt the Four Seasons, because to actually appeal to the same customers they’d need adopt the cost base (for things like gardens, function rooms, gymnasiums), which means they’ll have to charge rates similar to the Four Seasons, and as a result their best outcome would be to eventually have cloned their original target. And their original target won’t be sitting still while all that happens. The ghost car in Mario Kart represents the best possible execution that is always within your grasp, always just one touch away. In your company your ghost car has five nines reliability, with less bugs and more speed. It doesn’t take wrong turns, or add bad features. It gets up early, stays focused on what matters and doesn’t waste time looking at blogs like this one. It’s the best possible version of your product, your company, and the people in it. And it’s the only competitor you should think about.